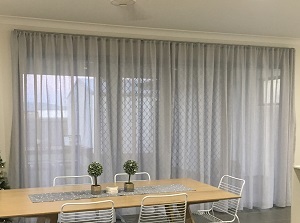 Follow the instructions below as a guide to help to install your curtain tracks for a Wall Mount and a Ceiling Mount as well as how to hang your curtains for S-fold and Gathered headings. 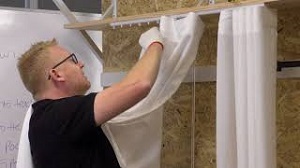 The process is the same for both single and double curtains. You will have received either Standard Brackets or Extension brackets with your wall mounted tracks. You have up to 50mm clearance with the standard bracket and up to 90mm clearance with the extension bracket. Adjust the brackets to the correct position to ensure you can come over the top of an architrave, roller blind or plantation shutter and clear any obstructions that may stop the curtain from hanging freely. Make sure all of your brackets are adjusted to the exact same position. There will be a number of timber studs that run through your wall. Using a stud finder, locate as many of these as possible to fit your brackets into. If you need to mount any of your brackets into plaster, use a Hollow Wall Anchor tool for a secure finish. How to use a Hollow Wall Anchor is featured in the "How to Install - Ceiling mount video"
Fix the brackets across the wall where the track is to be placed. Ensure the brackets are spaced evenly. Use a string line to ensure all of your brackets are level across the top and nice and straight. Consider the stack end and add another bracket here as this is where the full weight of the curtain will be when in the open position. Ensure all your bracket cams are in the open position. Present your track to the brackets, and lock the cam in place. Your track is now fully installed and you are ready to hang your curtain. Make sure the cam lock on the bracket is in the open position. Place the bracket on top of the track and close the cam. Your bracket is now installed onto the track. Repeat this step for all brackets. Slide the brackets up and down the track to space them evenly across the track. Add another bracket to the stack end as this is where the full weight of the curtain will be when in the open position. Your track is now installed. Easy! Present the track to the ceiling and with a pencil, mark through the bracket holes where your screw holes are going to be. Get your drill and drill an 8mm hole where you have placed your marks. Using a Hollow Wall Anchor tool, insert the hollow wall anchors into the 8mm holes you have just drilled. Re present your track to the ceiling. Then simply take the hollow wall anchor screw and screw this through the bracket into the hollow wall anchor in the ceiling. This will give you a really secure fixing. Done! Your track is installed and you are now ready to hang your curtain. With a pair of long nose pliers, open up the hook at the top of the wand. The track will have a wand runner inserted as the second runner from the control side. It's a little piece with a metal loop. Simply insert the hook of the wand into the metal loop and your wand is now installed. With your S-fold curtains, you will receive a packet of white plastic curtain hooks. These need to be inserted into the curtain heading tape, which is attached to the top of your curtain. If you have some gloves, put these on now so that you don't get any dirty marks on your curtain. The curtain heading tape contains little box pockets. Place the first hook into the 3rd pocket (there will be half a pocket,1 pocket, 2 pockets). The 3rd pocket will be marked with a grey dot. Insert the hook and turn it around. Leave 5 pockets empty and then insert the 2nd hook. Each one of these pockets will be marked with a grey dot. Repeat this step until you have filled all the marked pockets. You will see at the end that there should be exactly the same spacing as at the start with 2 and 1/2 empty pockets. Place the weight of the curtain over your shoulder ensuring the hooks are at the front. Evenly space out all the runners across the width of the track. Clip the first hook into the first runner. Repeat this step until all of the hooks are inserted into the runners. The number of runners will match exactly to the number of hooks, so it's really important that you don't miss one, otherwise, you will need to start all over again. Release the curtain from your shoulder and let it hang. Adjust the heading tape so you have the back, front, back, front S-fold shape. Both ends should return back to the wall. Your curtain is now fully installed. With a pair of long nose pliers, open up the hook at the top of the wand. Install your wand on the 2nd runner from the control end, leaving the first runner free. Simply insert the hook of the wand into the metal loop and your wand is now installed. The track for a gathered heading comes with free-floating runners. To make it super easy for your install, evenly space the runners along the width of the track. Step 3 - Hanging the Curtain. With a gathered heading, the hooks are already inserted into the heading tape for you. Place the weight of the curtain over your shoulder ensuring the hooks are at the front. Release the curtain from your shoulder and let it hang. It's that easy to install your curtains! Remember - You are not alone. We are here to help. 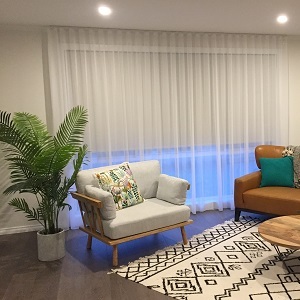 If you have any challenges during installation, please give us a call on 1300 664 257, send us a Quick Enquiry or book in for a personal 1:1 session on line. One of our expert team members will work with you to achieve the stunning results you deserve.